Homeowners and property investors alike can benefit from the comfort, luxury, and quality offered by a freestanding tub. Often, people underestimate the value that this classic porcelain style can provide for a space. If you have considered investing in a luxurious bathtub in Vancouver or the surrounding areas, SaveMore Plumbing & Lighting is here to serve as your trusted plumbing store for high-end solutions that don’t need to break the bank. You are likely here because you are seeking luxury plumbing fixtures, and our team is ready to help! We are proud to provide the best results through our two plumbing and lighting showrooms in Vancouver and Surrey. For years, we’ve provided the best home lighting, faucets, sinks, basins, bathtubs, steam showers, home decor, and more to our happy customers. If you’re here for a freestanding tub, be sure to catch up on our guide below before shopping today! Finding the best fit for your home can result in long-term enjoyment for your family. 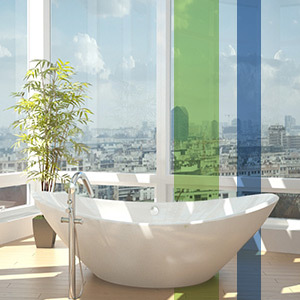 In order to succeed in buying your ideal bathtub, several factors need to be taken into consideration first. From the size of your tub to the faucet and accessories used, every aspect of your bathroom design can benefit from the professional services at SaveMore! In order to provide the best home plumbing fixtures, we need to understand your needs and goals for investing in this high-quality product beforehand. The biggest factor in determining the enjoyment of your freestanding tub is its size. Keep in mind that freestanding bathtubs are beautiful and luxurious, but their design does require more space for the best outcome. There are several aspects to cover if you are shopping for a freestanding tub at our lighting and plumbing showroom. Be sure to measure the space where your tub will be, as well as the clearance provided by your halls and doors for transportation. Your new bathtub may fit perfectly in the bathroom, but getting it there may be a challenge! Alcove bathtubs are used for your bathroom alcove, a space that is contained by three walls. In this setting, two long lengths curve and intersect on the ends to create a standard pool. You can find this tub in the standard length of 60 inches (or 152 centimeters) with a width of 32 inches (81 cm). Oval bathtubs are available for those wanting extra space to soak up the bubbles. Keep in mind that oval tubs are wider, but not longer. Remember this extra width when measuring your bathroom space! 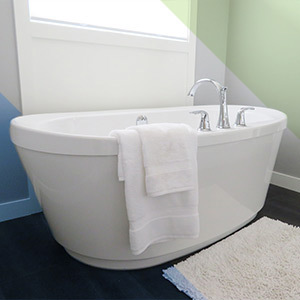 Corner bathtubs are ideal for maximizing the luxury of your freestanding tub experience. As the name implies, this tub comes in a square shape and is normally situated in the corner of spaces with enough room. Keep in mind that you’ll need roughly 156 centimeters on both sides to make this bathtub fit. Whirlpool tubs may seem larger and more intense when it comes to finding space in your Vancouver home, yet most options of this tub come in the standard alcove size. Modern bathtub improvements can include a whirlpool device to make the most of your standard tub. Widening doors, removing drywall, and other move-in demands can quickly increase the cost of your bathtub installation, so be sure to measure thoroughly before making your purchase! Your new freestanding tub from SaveMore Plumbing should have at least 10 centimeters on all sides to account for clearance and maintenance demands. Be sure to include the faucet, water lines, and any other needed equipment in your measurements! Your unique home style can be hard to match, but luckily, there are many styles of freestanding tubs available through SaveMore. Our high-end plumbing renovation team is here to help through every step of the purchasing process, combining our comprehensive knowledge with quality relationships among the top vendors in the world. What you’re left with is a wide range of tubs that are diverse enough to enhance the quality of many Vancouver homes. Single ended. If you’re seeking a classy, timeless design that captures the spirit of the American Dream, single-ended bathtubs are a smart option. Featuring one end that is rounded for lounging and comfort, this bathtub style is commonly seen across the country. Double ended. As the name implies, double-ended tubs are curved on both ends to double the amount of lounging space. These gentle slopes are tailored for comfort, allowing couples to relax together in appropriately sized models. A center faucet is the perfect reason why you should invest in a freestanding tub! Single slipper. Similar to single-ended bathtubs, single slippers provide one curved edge for comfort and one straight edge for plumbing fixtures. The difference, though, is that these tubs are further raised on the sloped end to create a slipper. If you’re looking for enhanced back support, this may be the freestanding tub for you. Double slipper. Those seeking a high level of support and comfort can benefit from investing in double-slipper bathtubs. You can expect two high sides for couples to lounge with the plumbing elements being located in the center. Clawfoot. This classic freestanding tub has been widely used since the Victorian Era and features a timeless beauty that is hard to match. Featuring four legs to form the base, these luxury bathtubs are available in numerous styles and sizes. Pedestal. Also known as skirted tubs, this style provides beauty and stability by utilizing a pedestal to form the base. Homeowners and constructors alike can benefit from freestanding pedestal tubs, as this option comes in a wide range of sizes and styles to ensure an ideal fit for your space. Soaking. Japanese soaking tubs are ideal for those in need of a freestanding tub without the space to spread out. Most models are much smaller in width, being taller to make up for the smaller radius. Soaking tubs are also beneficial if you’re looking for a cost-effective way to relax and unwind. Walk-in. SaveMore Plumbing & Lighting is proud to provide a wide range of freestanding tubs for all of our consumers. Quality walk-in tubs from Valley Acrylic and other producers provide ADA-compliant results for residents in need of assistance. If you have a style in mind, or you aren’t sure which freestanding tub would look best in your home, be sure to stop by our plumbing showrooms in Vancouver or Surrey to begin shopping for the best results! The sheer number of tub styles available can be intimidating, but when you consider the material options, the choices can prove to be too much to make an easy choice. SaveMore Plumbing & Lighting is here to provide you with material choices that perfectly match your style, needs, and budget. Luxury bath fixtures are made to deliver the highest level of quality in both use and appearance, so be sure to sign on with the right lighting and plumbing store for your needs! 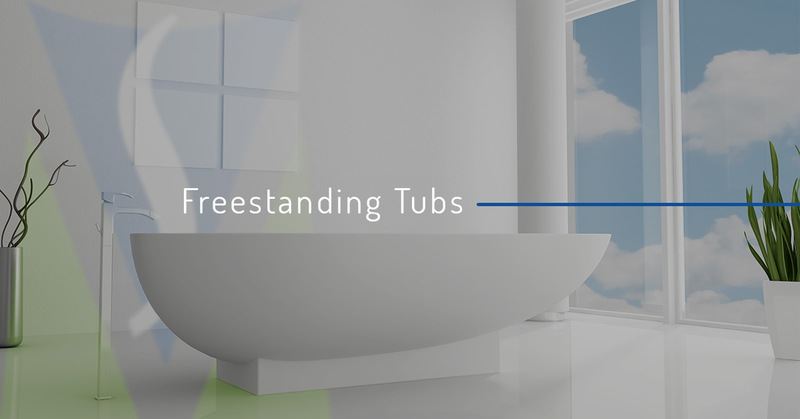 Freestanding tubs come in many materials, making it important for homeowners and industry professionals alike to find the choice that matches their style, budget, and personal preferences. Acrylic – A majority of freestanding tubs are comprised of acrylic. This versatile material is durable, affordable, and lightweight. New bathtubs can be moved and installed with ease while the consumer enjoys years mold-free quality. Copper – While our company supplies mostly acrylic freestanding tubs, copper is one option from Native Trails that provides a unique level of luxury. Copper tubs are beautiful, versatile, and come in a wide range of colours. Best of all, they have the ability to conduct heat better, maintain a steady temperature for long-term relaxation. Cast Iron – If you are looking for an extremely durable and long-lasting bathtub, a cast iron freestanding tub may be your first choice. These historical plumbing fixtures are comprised of iron and coated with porcelain, retaining heat for those extended soaks. Keep in mind, though, that these freestanding tubs tend to be among the heaviest! Stainless Steel – Modernists across Vancouver and beyond can rejoice from the contemporary style of a stainless steel tub. You can benefit from minimal maintenance and optimal appearances! Solid Surface – Those seeking a luxury bathtub comprised of a resin material can benefit from this material option. Solid-surface tubs typically feature walls, drains, and other elements built into the material for a smooth, seamless outcome. Minimal maintenance and professional designs help to make this material a good choice for some consumers. Stone – One beautiful option that serves as the center of your home design is the stone tub. These high-end plumbing fixtures incorporate fine details and amazing styles to create a beautiful, natural element that is sure to impress all who see them. Choosing the right style, size, and material of your freestanding tub is vital for achieving the best possible results. Once you have made these choices, it’s time to choose the personal elements that make your bathroom renovation truly yours. Personalised colours, textures, and designs can provide an added touch to match the beauty of your new bathtub. Your tub’s faucet, for example, can elevate the aesthetics and convenience of your bath. Tap decks. Many freestanding tubs feature a flat area along the ridge, called a tap deck. This space is typically reserved for mounting your faucet, whether with pre-drilled holes or the use of a drill. Rolled rims. Bathtubs that feature a curved rim with no flat spaces will require a stable surface for your faucet. Unlike tap decks, these freestanding tubs will need a specific faucet to match or be mounted on a nearby wall. Inner walls. One style that is not seen as commonly these days is the drilling of holes within the tub for mounting purposes. This choice is often reserved for cast iron fixtures and will likely be pre-drilled for your convenience. What makes your freestanding bathtub superior to the vast array of styles available out there? Our team is here to tell you that the quality of your local plumbing store can help to provide comprehensive quality and luxury when it comes to home bath and kitchen products. SaveMore Plumbing & Lighting is here to serve as your source for high-end freestanding bathtubs in Vancouver and beyond, delivering quality results to enhance your space. From homeowners to home remodeling pros, we help everyone find the luxury plumbing fixtures they need for the best outcome. Browse our inventory before stopping by one of our high-end remodeling showrooms in Vancouver or Surrey. SaveMore is here and ready to provide the highest level of quality for your home. We look forward to hearing from you!